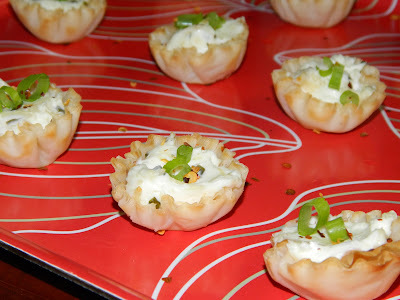 These are an easy, hot appetizer that my guests always enjoy. Just five ingredients, most you probably have on hand already! Preheat oven to 350 degrees F. Let frozen Athens Mini Fillo Shells thaw for 10 minutes. In a small bowl, mix cream cheese and Parmesan. Fill fillo shells with cheese mixture and place on a baking tray. Bake for 7 minutes. Remove from oven and top with spring onion and red pepper flakes.